Polymeric components are desirable in optical and photonic applications because of their light weight, high impact resistance, and/or ability to be formed into sophisticated shapes or gradient index (GRIN) optics. However, relatively large thermal effects in polymers can limit applications. We studied a selected series of amorphous polyimides in order to evaluate their potential application in components of optical devices. Several of these polyimides have thermo-optic coefficients (dn/dT) and volume coefficients of thermal expansion (VCTE) about 50% smaller than those of standard optical polymers, such as PMMA and polycarbonate. Surprisingly, these low dn/dT and VCTE values were found in amorphous polyimides which have sterically hindered, kinked linkages between phenyl rings. This suggests a different structural dependence than that found in previous studies, which showed that low thermal expansion in crystalline polyimides is correlated with a rigid linear backbone molecular structure. Thus, amorphous polyimides with favorable backbone structures represent a class of materials with improved thermo-optical stability for polymeric optical devices. 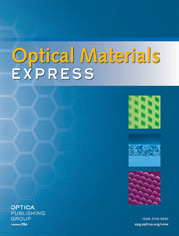 A. Boyd, M. Ponting, and H. Fein, “Layered polymer GRIN lenses and their benefits to optical designs,” Adv. Opt. Tech. 4 (5-6), 429–443 (2015), available at www.peaknano.com/whitepapers . H. Fein and M. Ponting, “Analytical study of thermal invariance of polymeric nanolayer gradient index optical components,” Proc. SPIE 9822, 98220X (2016). J.-C. Kim and J.-H. Chang, “Quarternary copolyimides with various monomer contents: thermal property and optical transparency,” Macromol. Res. 22(11), 1178–1182 (2014). M. Hasegawa, T. Ishigami, J. Ishii, K. Sugiura, and M. Fujii, “Solution-processable transparent polyimides with low coefficients of thermal expansion and self-orientation behavior induced by solution casting,” Eur. Polym. J. 49(11), 3657–3672 (2013). Y. Terui and S. Ando, “Polarization dependence of thermo-optic coefficients in polyimide films originating from chain orientation and residual thermal stress,” J. Appl. Phys. 116(5), 053524 (2014). M. T. Pottiger, J. C. Coburn, and J. R. Edman, “The effect of orientation on thermal expansion behavior in polyimide films,” J. Polym. Sci., B, Polym. Phys. 32(5), 825–837 (1994). R. Ishige, T. Masuda, Y. Kozaki, E. Fujiwara, T. Okada, and S. Ando, “Precise analysis of thermal volume expansion of crystal lattice for fully aromatic crystalline polyimides by X-ray diffraction method: relationship between molecular structure and linear/volumetric thermal expansion,” Macromolecules 50(5), 2112–2123 (2017). T. Kurosawa, T. Higashihara, and M. Ueda, “Polyimide memory: a pithy guideline for future applications,” Polym. Chem. 4(1), 16–30 (2013). N. Sensui, J. Ishii, A. Takata, Y. Oami, M. Hasegawa, and R. Yokota, “Ultra-low CTE and improved toughness of PMDA/PDA polyimide-based molecular composites containing asymmetric BPDA-type polyimides,” High Perform. Polym. 21(6), 709–728 (2009). G. Beadie, M. Brindza, R. A. Flynn, A. Rosenberg, and J. S. Shirk, “Refractive index measurements of poly(methyl methacrylate) (PMMA) from 0.4-1.6 μm,” Appl. Opt. 54(31), F139–F143 (2015). T. H. Jamieson, “Thermal effects in optical systems,” Opt. Eng. 20(2), 156–160 (1981). S. H. Goods, R. M. Watson, and M. Yi, “Thermal expansion and hydration behavior of PMMA molding materials for LIGA applications,” Sandia Report SAND2003–8000 (2003). R. A. Orwell, “Densities, coefficients of thermal expansion, and compressibilities of amorphous polymers,” in J.E. Mark, ed., Physical Properties of Polymers Handbook, 2nd Edition (Springer, 2007), pp. 93–102. Y. Sato, Y. Yamasaki, S. Takishima, and H. Masuoka, “Precise measurement of the PVT of polypropylene and polycarbonate up to 330°C and 200 MPa,” J. Appl. Polym. Sci. 66(1), 141–150 (1997). S. Numata, K. Fujisaki, and N. Kinjo, “Re-examination of the relationship between packing coefficient and thermal expansion coefficient for aromatic polyimides,” Polymer (Guildf.) 28(13), 2282–2288 (1987). R. E. Barker., “Grüneisen numbers for polymeric solids,” J. Appl. Phys. 38(11), 4234–4242 (1967). Y. Wada, A. Itani, T. Nishi, and S. Nagai, “Grüneisen constant and thermal properties of crystalline and glassy polymers,” J. Polym. Sci 7(Part A-2), 201–208 (1969). R. K. Jain and R. Simha, “Theoretical equation of state: thermal expansivity, compressibility, and the Tait relation,” Macromolecules 22(1), 464–468 (1989). S. Shenogin, N. Raravikar, R. Ozisik, and P. Keblinski, “Using vibrational mode analysis for predicting the coefficient of thermal expansion of amorphous polymers,” J. Polym. Sci., B, Polym. Phys. 47(21), 2114–2121 (2009). A. I. Slutsker, L. A. Laius, I. V. Gofman, V. L. Gilyarov, and Y. I. Polikarpov, “Mechanisms of reversible thermal deformation of oriented polymers,” Phys. Solid State 43(7), 1382–1388 (2001). G. D. Barrera, J. A. O. Bruno, T. H. K. Barron, and N. L. Allan, “Negative thermal expansion,” J. Phys. Condens. Matter 17(4), R217–R252 (2005). S. Neyertz and D. Brown, “The effect of structural isomerism on carbon dioxide sorption and plasticization at the interface of a glassy polymer membrane,” J. Membr. Sci. 460, 213–228 (2014). I. H. Malitson, “Interspecimen comparison of the refractive index of fused silica,” JOSA 55(10), 1205–1209 (1965). T. M. Tong, H. K. D. Hsuen, K. L. Saenger, and G. W. Su, “Thickness-direction coefficient of thermal expansion measurement of thin polymer films,” Rev. Sci. Instrum. 62(2), 422–430 (1991). M. T. Pottiger, B. C. Auman, J. C. Coburn, and T. D. Krizan, “Process for preparing a polyimide film with a preselected value for CTE,” U.S. Patent # 5,166,292 (1992). Fig. 1 Molecular structures of the monomers in this study. Fig. 2 Schematic representation of polyimide synthesis reactions. Fig. 3 Measured refractive index, n( T ), for mBAPS-BTDA. Solid circles: TE polarization. Open circles: TM polarization. The lines are linear least-squares fits to the data. Fig. 4 Lorentz-Lorenz function, L( T ), calculated from the data in Fig. 3 (circles), and the corresponding change in volume, ΔV/ V 0 (triangles), for mBAPS-BTDA. The lines are the respective linear least-squares fits. Fig. 5 The VCTE ( β ) vs. 1/ m * , where m * is the monomer molecular weight. The solid points are color coded to identify the dianhydride component of the amorphous polyimides studied here. The black open points are data for the crystalline polyimides previously reported by Ishige et al. , along with a corresponding least squares linear fit (black line). (1) n a v e = ( 2 n T E 2 + n T M 2 ) / 3 . (5) βΔT= ΔV V( T 0 ) = L( T 0 ) L( T 1 ) −1. (6) 1 f =( n−1 )( 1 R 1 − 1 R 2 ). (7) d( 1 f ) dT =( 1 R 1 − 1 R 2 )( dn dT −( n−1 )( β/3 ) ). (8) 1 f ( df dT )=( β/3 )−( 1 n−1 )( dn dT ). (9) dn dT =− ( n 2 −1 )( n 2 +2 ) 6n β. (10) 1 f ( d f d T ) = − ( n 3 + n 2 + 4 n + 2 n 4 + n 2 − 2 ) ( d n d T ) . (13) β≈3 k B ργK( 1 m * ).